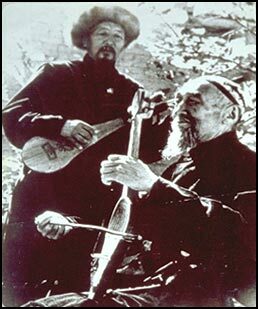 "If Toktogul was the greatest Kyrgyz akyn of the pre-Revolutionary and early post-Revolutionary years," writes Beliaev, "then Muratali Kurenkeyev must be named the most outstanding exponent of instrumental artistry of those years." The son of a well-known performer and composer, Kurenkei (1826-1907), Muratali became a master of both kyl kiak and komuz. He is especially remembered for his kiak performances: "When he played," says Nurak Abdirakmanov, a featured artist in the Kyrgyz national folk music ensemble, Kambarkan, "it was not like a man playing an instrument; it was like the cry of a wild animal." Zataevich, who transcribed many of his compositions, called Muratali "...the most typical representative of Kyrgyz music and an artist with a wealth of folk humor and keen observation." His grandson, Toltoy Murataliev Kurenkeyevich, learned music as a child from Muratali and is the last of a musical hereditary lineage going back at least to the early 19th century. On the anthology, 'Shüüdüngüt's Road: Music of the Kyrgyz People of Central Asia', he performs two of his grandfather's best-loved compositions, including "Ker Özön" (The Wide Ravine), which evokes the beauty of nature. Murataliev plays not only his grandfather's music but his kiak as well, an instrument which his grandfather once played for Stalin and which Murataliev reports is 300 years old!